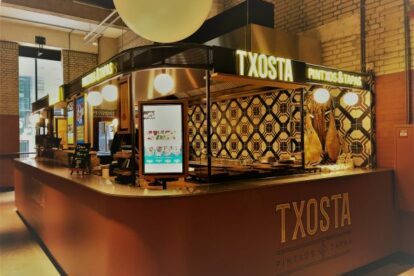 Located on the left side near the entrance of the Foodhallen in Rotterdam (from the side of hotel Bruno) is the Spanish stand Txosta. If you are craving some amazing jamon iberico, tapas or pinchos, Txosta is the place to be. The chef at this stand, Alvaro Martinez, used to be the chef at world-renowned El Bulli, the three starred Catalan restaurant. Breathe, the prices are more than reasonable, especially for the amazing quality of food put before you. There are gorgeous pinchos and tapas platters for sharing, and I will be honest, you don’t want to share at all, because it is all too delicious. The pinchos platters vary in size and you can choose from 6, 9 or 15 pieces, and all pinchos can be bought individually as well. The jamon iberico is of outstanding quality and the pan con tomate is simplicity done excellently. The croquetas are just the right accompaniment with your drinks and please, if in doubt between the croquetas jamon Iberico and the croquetas de gamba, life is short, take them both. The patatas Txosta are not to be missed: patatas bravas with a topping. I love the pisto (a Spanish vegetable stew) with poached egg, but my personal plate of comfort is the patatas with braised veal cheek which melts in your mouth and truly reveals the skill of the chef. It is a culinary hug and who doesn’t like a hug? Txosta is self care at its finest.